What Men Want is a 2019 American fantasy comedy film directed by Adam Shankman. A loose remake of the 2000 film What Women Want, the plot follows a woman who, after drinking a potent concoction given by a shaman, gains the ability to hear men's inner thoughts. It stars Taraji P. Henson, Aldis Hodge, Richard Roundtree, Wendi McLendon-Covey and Tracy Morgan. The film was released in the United States on February 8, 2019, by Paramount Pictures. It has grossed over $50 million worldwide received mixed reviews from critics, who praised Henson's performance but said the film was too safe and offered little new to the genre beyond the gender-switching aspect. For other uses, see What Men Want (disambiguation). What Men Want is a 2019 American fantasy comedy film directed by Adam Shankman. A loose remake of the 2000 film What Women Want, the plot follows a woman who, after drinking a potent concoction given by a shaman, gains the ability to hear men's inner thoughts. 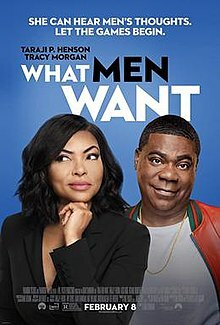 It stars Taraji P. Henson, Aldis Hodge, Richard Roundtree, Wendi McLendon-Covey and Tracy Morgan. The film was released in the United States on February 8, 2019, by Paramount Pictures. It has grossed over $50 million worldwide received mixed reviews from critics, who praised Henson's performance but said the film was too safe and offered little new to the genre beyond the gender-switching aspect. Paramount announced that it would be developing a remake of the 2000 Nancy Meyers film What Women Want. On November 14, 2017, it was announced that Taraji P. Henson would star in the lead role. On February 2, 2018, Adam Shankman signed on to direct the film. Max Greenfield and Tracy Morgan were also added to the cast. As of February 25, 2019[update], What Men Want has grossed $45.5 million in the United States and Canada, and $4.6 million in other territories, for a worldwide total of $50.1 million, against a production budget of $20 million. In the United States and Canada, What Men Want was released on February 8, 2019, alongside The Lego Movie 2: The Second Part, Cold Pursuit and The Prodigy, and was projected to gross $18–20 million from 2,912 theaters in its opening weekend. It made $6.6 million on its first day (including $1.25 million from Thursday night previews). It went on to debut to $19 million, finishing second behind The Lego Movie 2. In its second weekend the film grossed $10.9 million, finishing fourth, and then $5.2 million in its third weekend, finishing sixth. On review aggregator Rotten Tomatoes, the film holds an approval rating of 46% based on 80 reviews, and an average rating of 5.3/10. The website's critical consensus reads, "Admittedly uneven but easy to like, What Men Want proves a gender-swapped remake can work -- and the odds are substantially improved with Taraji P. Henson in the lead." On Metacritic the film has a weighted average score of 51 out of 100, based on 23 critics, indicating "mixed or average reviews". Audiences polled by CinemaScore gave the film an average grade of "A-" on an A+ to F scale, while those at PostTrak gave it an 82% overall positive score and a 69% "definite recommend". The Hollywood Reporter's Justin Lowe praised the film's pacing and jokes, and said the film featured a "predictably satisfying conclusion." Writing for The Washington Post, Sonia Rao gave the film two out of four stars, calling it a "so-so gender-flipped remake" and praising Henson's performance, writing, "It would make a perfectly fine airplane movie. Or maybe save it for the bachelorette party." ↑ Waters, Jas (14 August 2018). "This is my first feature film credit. This was 3 months of my life last fall that taught me A LOT about A LOT. Grateful to be apart of it. Thank you @willpowerpacker #WhatMenWant in theaters in January". Retrieved 6 February 2019. 1 2 3 "What Men Want (2019)". Box Office Mojo. Retrieved February 26, 2019. 1 2 3 "'What Men Want': What Critics Are Saying". The Hollywood Reporter. February 7, 2018. Retrieved February 9, 2019. ↑ Evans, Nick. "Paramount to develop a remake of "What Women Want"". Cinema Blend. Retrieved 22 Jun 2018. ↑ Fleming Jr, Mike. "Taraji P. Henson to star in Paramount's Remake of "What Women Want"". Deadline. Retrieved 22 Jun 2018. ↑ Kroll, Justin. "'New Girl' star Max Greenfield to join Taraji P. Henson in "What Men Want"". Variety. Retrieved 22 Jun 2018. ↑ Johnson, Zach (14 August 2018). "Taraji P. Henson Cracks the Boys' Club in What Men Want Trailer". EA Online. Retrieved 17 August 2018. ↑ D'Alessandro, Anthony (February 5, 2018). "'The Lego Movie 2' Will Put The Box Office Back Together Again With $50M+ Opening". Deadline Hollywood. Retrieved February 5, 2019. 1 2 D'Alessandro, Anthony (February 9, 2018). "'Lego Movie 2' Breaks Down To $31M+; 'What Men Want' Solid With $18M+ In Another Blasé B.O. Weekend". Deadline Hollywood. Retrieved February 9, 2019. ↑ D'Alessandro, Anthony (February 17, 2019). "'Alita's Agita At The Domestic B.O. : James Cameron Production Headed To $37M+ 5-Day". Deadline Hollywood. Retrieved February 17, 2019. ↑ "What Men Want (2019)". Rotten Tomatoes. Retrieved February 11, 2019. ↑ "What Men Want reviews". Metacritic. Retrieved February 9, 2019. ↑ "Find CinemaScore" (Type "What Men Want" in the search box). CinemaScore. Retrieved February 11, 2019.